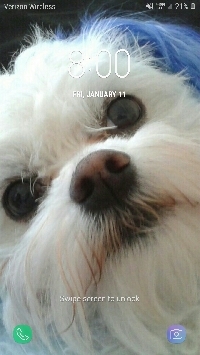 I have a maltese named ZuLu. He's a service dog and goes everywhere with me. He loves looking in my happymail. So he is the inspiration for this one. Send your partner a pic of your furbaby artfully done in any medium, except photography. I know its not easy to draw a pet or paint them or mixed media them... Anyway I thought it would be a fun way to share out besties with each other. If you don't have a pet no problem you can design any animal that can be a pet that you would like to have as a pet or any pet you have had in the past. On the back tell your partner about your pet and why they were your inspiration, or something cute/funny your pet and you do together. Size 4"*6" make it durable of course. Any medium envelopes optional. Everyone welcome. Newbies and international swapers all OK.
And any who want to see the inspiration for this swap he has his own instagram @zuleezu He's the one with blue ears and all his comentary on his pics I write in his voice. I'm sure he would love a message if you visit him there. I read all of the messages to him.